Clear PET heavy wall jars are offered with frosted black F217 lined caps. The black caps are composed of polypropylene plastic with a frosted matte finish. 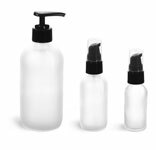 These plastic jars have durable, thick, low profile walls, and with universal F217 liners within the caps, this set offers tremendous versatility for many applications.